…. of your mouth will come to pass” she says. 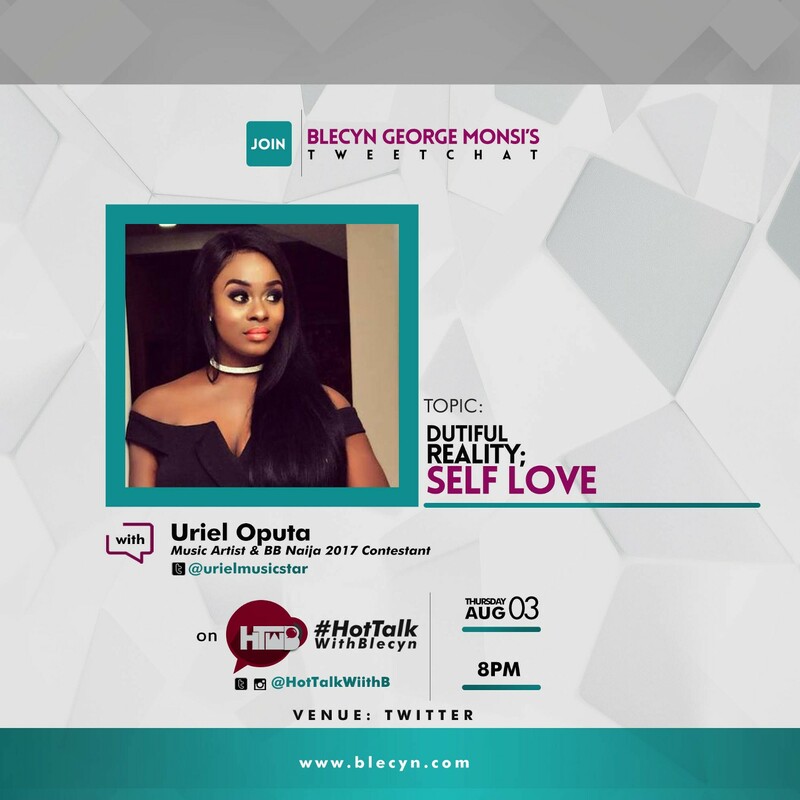 Blecyn George Monsi: It is really nice to have you on #HotTalkWithBlecyn @Urielmusicstar could you share with us the most important part of your body & why? Uriel Oputa: Hi guys.. so I would say the most important part of my body would be my mouth… because what you speak out of your mouth will come to pass. Blecyn George Monsi: Could you share with us what Self Love means to you? Uriel Oputa: Self love is loving both the good and bad side of yourself. I Learnt that the hard way. I love me even if i’m not perfect. Blecyn George Monsi: Kindly share with us the difference between “Self Love” and being “self-centred? Uriel Oputa: When you have self love, you are able to see things differently your mind becomes more open, you value everything and anyone around you,… Self centred; you are not able to see past yourself you don’t care about what others think or feel, your vibes are negative. Its a endless circle. I learnt to love myself at my lowest point. I had nothing and the only way to get myself out of this was to tell myself I love you. BGM: How would an individual know when he/she has “Self Love” ? UO: When you’re able to accept who you truly are, when you live for yourself and not society, when you understand that it’s okay to be me, even if i’m different. BGM: Would you describe a greedy man as someone who has excessive self-love? or Greed is a different ball game? UO: Greed and love are two different things it does not connect, a greedy man does not love but is possessive! BGM: What does self-love have to do with finding oneself and also getting new things for yourself? UO: To actually love yourself you need to understand who you are!! When that is understood, it enables you to understand your strength= growth =new things. BGM: Are there signs of true “Self-love”? If yes, please share. UO: Peace.., peace of mind. BGM: Does unconditional self-love means bringing yourself first before others, e.g your parents? or your kids? UO: No not really. You just feel content with yourself which could result in you putting others first. BGM: Back to you @Urielmusicstar could you please share with us how the journey after Big Brother Nigeria house has been? UO: Work work… it has brought out the business woman in me, in my mind i feel anything is possible, but also it has enhanced the feeling of fear. BGM: Would you say you are you more of a hunter or a gatherer? BGM: What three concerns about your life and business future keep you up at night? UO: My mum, thinking of ways to make her happy, business of course is the growth enough and my love life i’m still single. BGM: How would you convince someone to do something they didn’t want to do? BGM: Tell us about your music career and how you plan on pushing it to the next level? UO: Top secret just know this, everything i do is original. BGM: Has any record label in Nigeria or abroad approached you in regards to having you as part of their team? BGM: Tell us your greatest mistake and how you were able to accept and live with it? UO: Wow deep… loving my Ex BF then I did not have self love if I did I would have known he was not serious and i would not have wasted 5 years. How did I learn to deal with my Ex?… I became successful, I loved myself, built myself grew my self into the positive woman i am now. BGM: Any last words for us before we call it a day? As regards our topic or personal life? UO: Well I live to learn I learn to grow I grow to build I build to leave a legacy. BGM: A million Thanks to you @Urielmusicstar for coming on today’s episode of #HotTalkWithBlecyn keep being fun. God bless you. UO: Thank you so much…this has been fantastic. And that was my beautiful time out with Uriel, hope you learnt one or two things. If you are new to Twitter Chats and not sure how to join in, simply log into Tweetchat.com and use the hashtag #HotTalkWithBlecyn. You can then follow the flow of the conversation. Tweet me @HotTalkWithB with any questions about our chat or guest. Blecyn George Monsi is a screenwriter, a social media influencer, the creator /host of #HotTalkWithBlecyn Twitter Chat, a Digital Marketing/Communications Strategist who loves to be referred to as a Millennial Marketer. She has interviewed over 80 Thought Leaders with great portfolios from different industries including top celebrities within and outside Africa via her Popular Twitter Chat #HotTalkWithBlecyn featuring powerful conversations that foster youth development, career improvement and social responsibility. She has written over 15 screenplays for film productions, and 2 screenplays for TV series. Her website, www.blecyn.com is dedicated to showcasing her general interests in life, from to travel, to her food recipe, to personal development articles, and Behind The Scene (BTS) from book lunch, and selected movie premieres. The website also have excerpts of her #HotTalkWithBlecyn twitter chat amongst other great articles cutting across, Self Development and Career Improvement. You will also find really great quotes on her website. Peace Hyde On Benefits and Harms Of Peer Pressure To Individual’s Growth & Development.